Humans (with their brains, bodies and behaviors) are complex dynamical systems embedded in an environment that includes a multitude of other conspecifics. Moving beyond previous brain- centered views of the human mind requires to develop a parsimonious yet integrative account that relates neural, behavioral, and social scales. Social neuroscience has recently started to acknowledge the importance of relational dynamics when it extended its purview from social stimuli to human-human interactions. Human-machine interactions also constitute promising tools to probe multiple scales in a controlled manner. 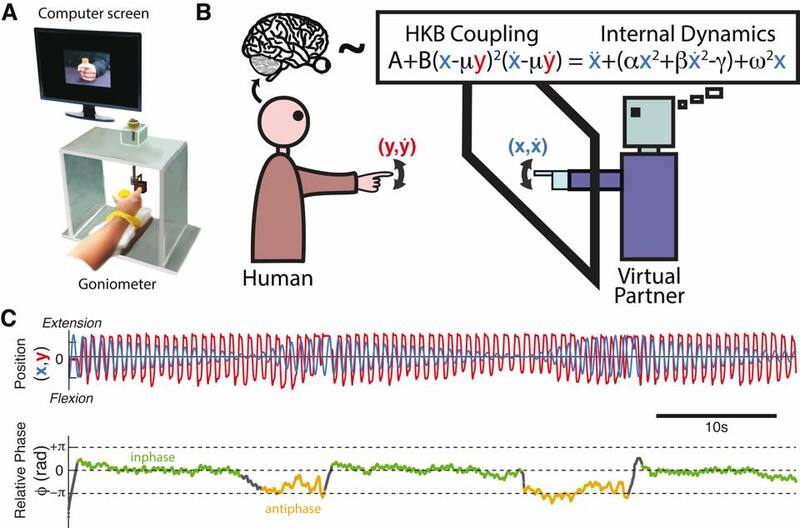 Inspired by the electrophysiological method of the dynamic clamp, Virtual Partner Interaction (VPI) allows real time interaction between human subjects and their simulations as dynamical system. This provides a new test bed for operationalizing theoretical models in experimental settings. We discuss how VPI can be generalized into a Human Dynamic Clamp (HDC), a paradigm that allows the exploration of the parameter spaces of interactional dynamics in various contexts: from rhythmic and discrete coordination to adaptive and intentional behaviors, including learning. HDC brings humans and machines together to question our understanding of the natural and our theory behind the artificial.